We associate it with Louis XVI, art nouveau furniture and the wall decorations of clubhouses, but when we talk about it we are generally referring to something quite different. Marquetry, otherwise known as inlay work, does not generate a positive response with people who like to surround themselves with modern design, but in what follows Architonic will do its best to rehabilitate its image. It is generally agreed that marquetry consists of inlay work, and strictly speaking only inlays made of wood can be designated as such, although inlays of other materials are generally also referred to as marquetry. 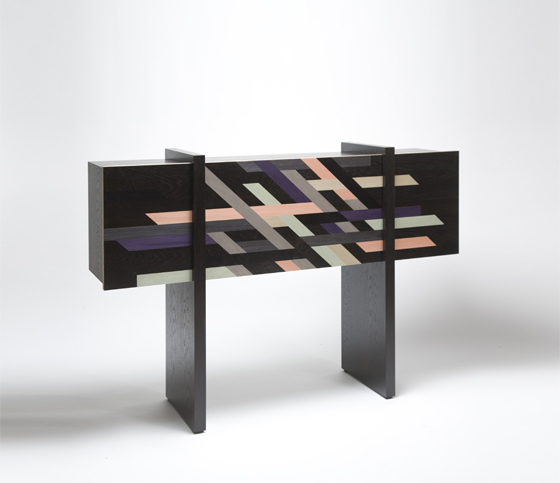 When we talk about wood inlays we are generally referring to marquetry. 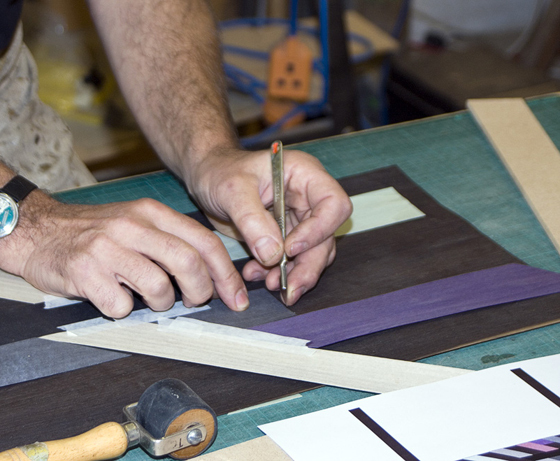 This is the most common technique of wood inlay work, which is created with high-quality veneers that are glued on to a wooden base. 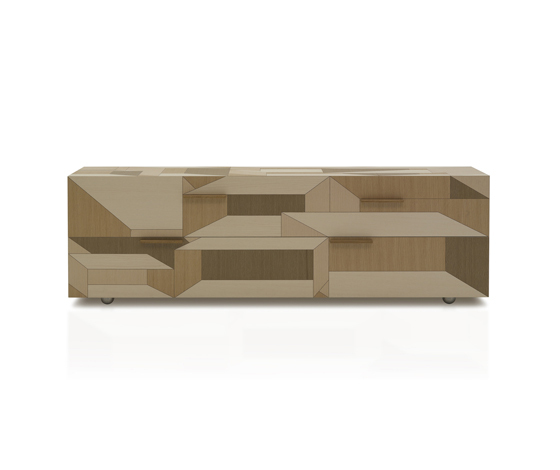 Thanks to CNC technology furniture with inlay work can nowadays be manufactured in series production. The Studiolo which was created in the 15th century within the Palazzo Ducale in Urbino, Italy, is unique and represents the best example of this art form in its own age. 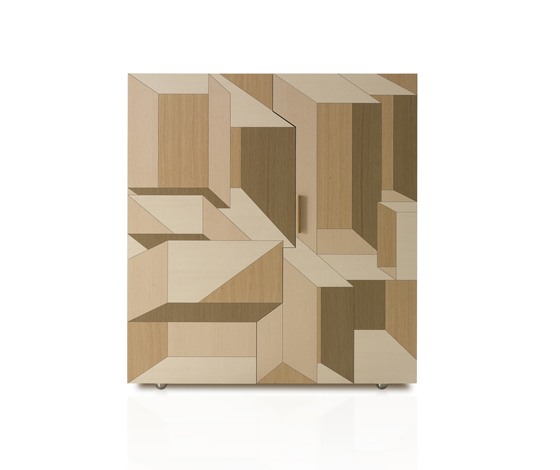 The marquetry consists of a 'real' inlay with a range of trompe-l'oeil effects, for which inlays with their inherent two-dimensional form consisting of veneers of different colours are ideal. Optical illusions can easily be created by the playful representation of varying perspectives with their interplay of light and shade. 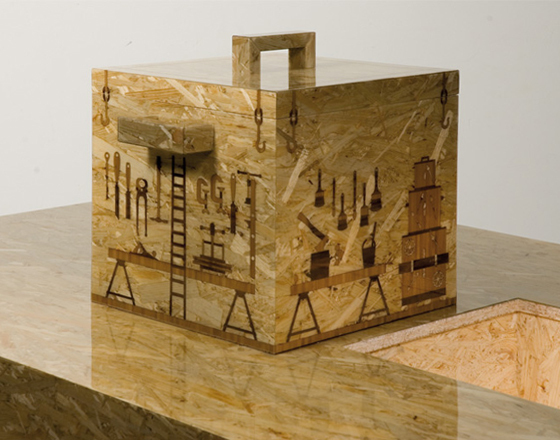 It is not just by the use of different types of wood that spatial representations using inlays can be created. Inlay work using shadows with gradients is also possible by means of the kind of refined techniques used by the English designer and marquetry artist Toby Winteringham: he immerses the pieces of veneer to be inlayed in hot sand, which creates a slight charring in the shading of the wood. In addition to the techniques of traditional craftsmanship Winteringham also applies CNC milling machines. 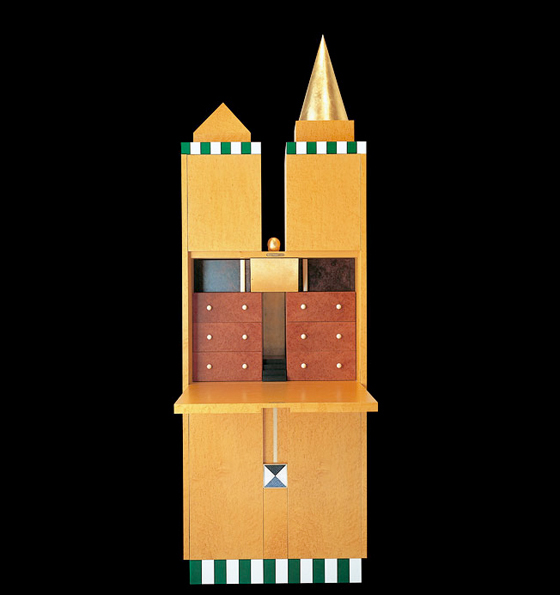 In addition to elaborate and intricate works his collection also contains simpler modern marquetry work which is no less sophisticated but is suited to larger production runs. 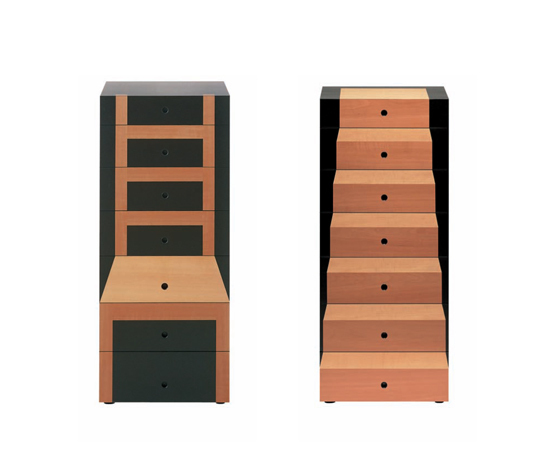 Inlays which create trompe-l'oeil effects have also been developed for the post modern designs created by Robert and Trix Haussmann for the Swiss firm of Röthlisberger. 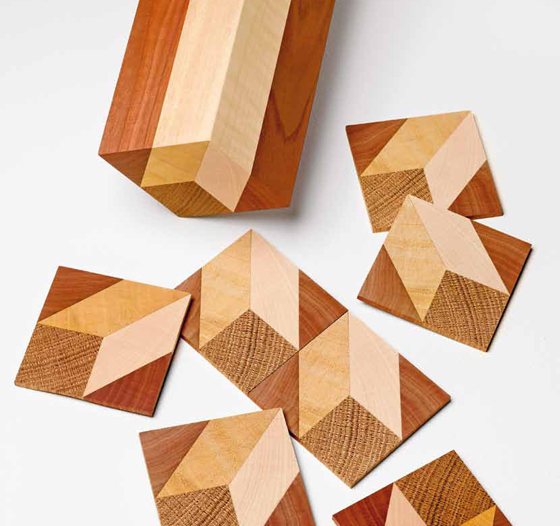 For this purpose the designers adopted historical techniques -- for example, for 'Lehrstück III' a repeating pattern of puzzle sections was produced by means of the same sawing techniques used in the 15th century. 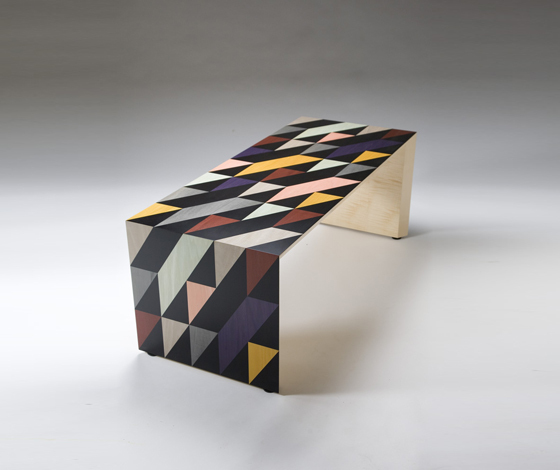 "Shift" table by Toby Winteringham; marquetry design by Patternity.co.uk. 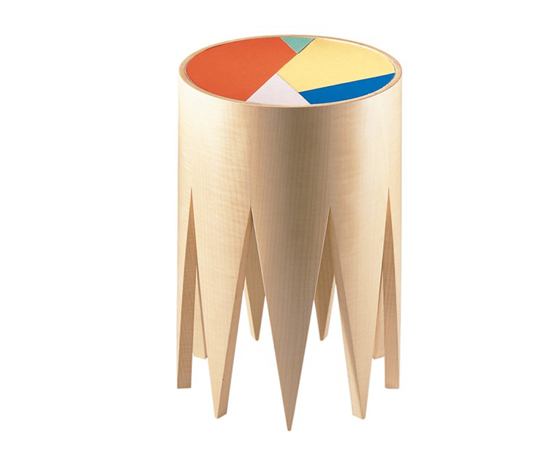 ; Made in Sycamore with marquetry in dyed veneers. Hand cut. 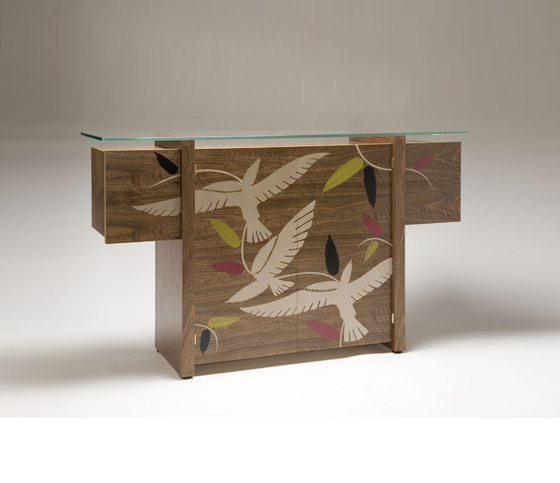 "Bird" Sideboard by Toby Winteringham and his daughter Grace Winteringham; This marquetry design of birds, feathers and leaves is laser cut. 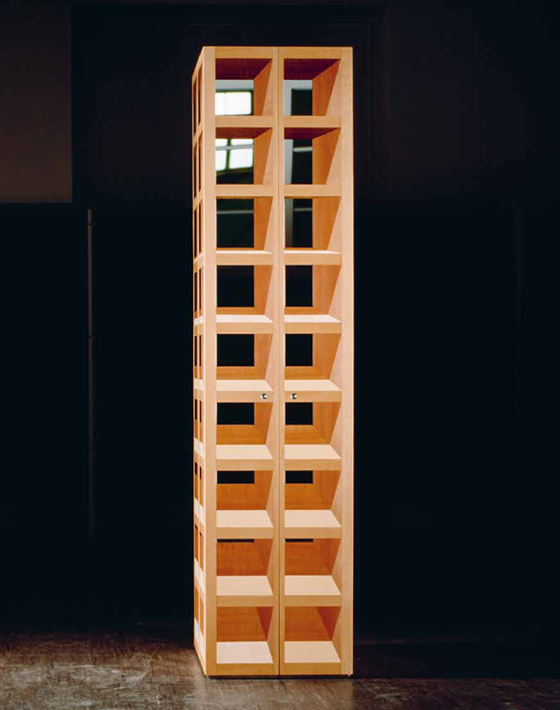 The cupboard "Torre", also produced by the Haussmanns for Röthlisberger, appears to the observer as a grid with empty spaces but in reality it is a trompe-l’oeil piece with solid surfaces. To create these illusions with areas of light and shade the craftsmen worked with unstained veneers in natural shades of maple, beach, pear and walnut. The illusion of transparency is achieved by the integration of mirrors. One intricate detail is that the pencil which is the signature of these works is also decorated with inlays. 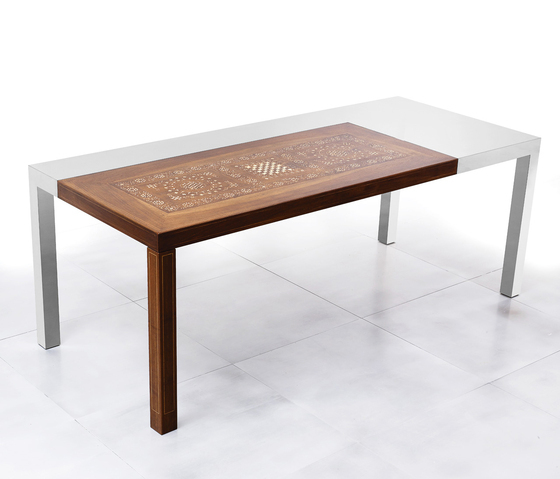 For Draenert the designer duo have created a dining table in the mannered post-modern style – a masterpiece of craftsmanship with inlays of walnut, maple, pear and ebony. 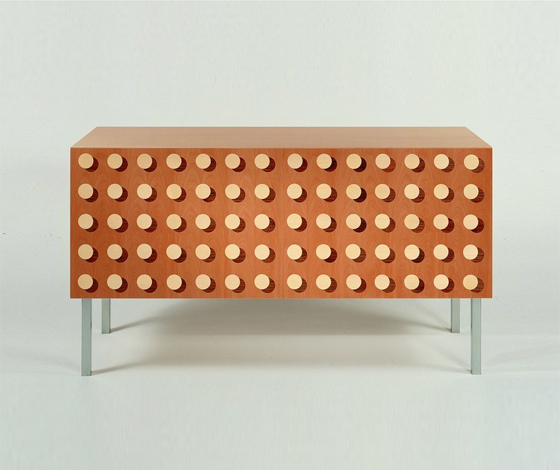 The "Frankfurter Möbel" furniture programme was also created for Draenert as part of a design series by the Frankfurt architects Norbert Berghof, Michael Landes and Wolfgang Rang, representing the German version of the post-modern and within it that of the Darmstadt-Frankfurt school. 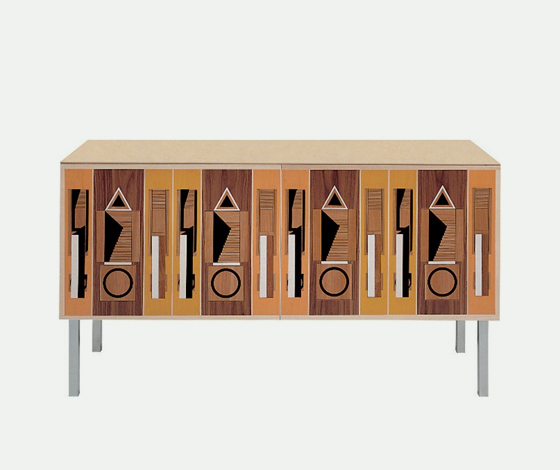 The Frankfurt "Schrank F1" is an escritoire made of bird's-eye maple, ebony, bruyère, root timber, solid maple, bubinga, ivory, horn, brass, gold leaf, Lasa and Aosta marble, Bahia Blue granite etc. 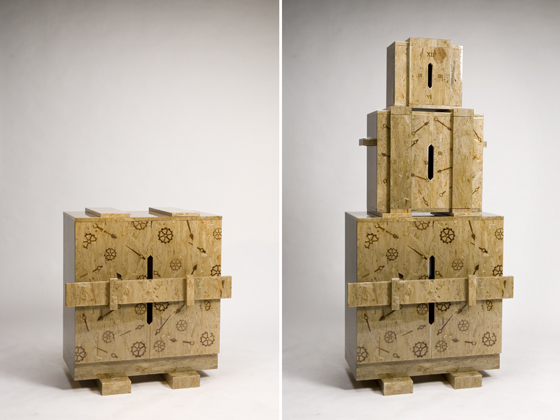 It has small safes, drawers and a writing top. Each one of the limited edition of 100 is numbered, dated and signed. As costly and exclusive masterworks the furniture in the "Frankfurter Möbel" range represents a reference to an elitist, bygone world. The "Job Lounge" by Studio Job is an ironic treatment of the same theme. The various designs, materials and production techniques in this room are quotes from the impressive work implemented by Studio Job and include cast bronze, stained glass in lead glazing form, ceramics, marquetry, papier-mâché, rusted iron, woven textiles and precious Venini glass. 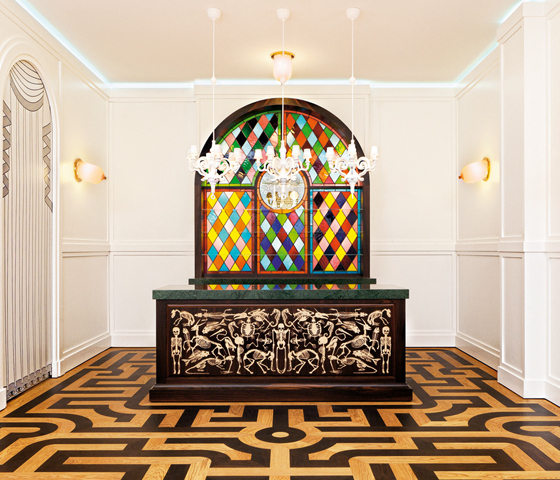 The marquetry of the unusual and very beautiful wood inlays of the bar represents deformed skeletons while the stylish parquet floor features a bewildering labyrinth. 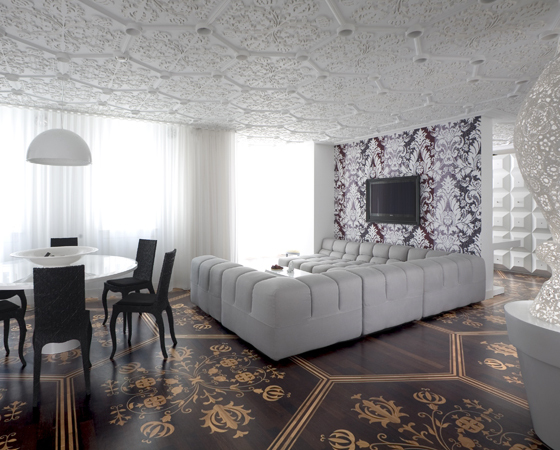 The luxurious apartment in Amsterdam designed by Marcel Wanders lies somewhere between citing or even evoking a past epoch and making an ironic comment on it. 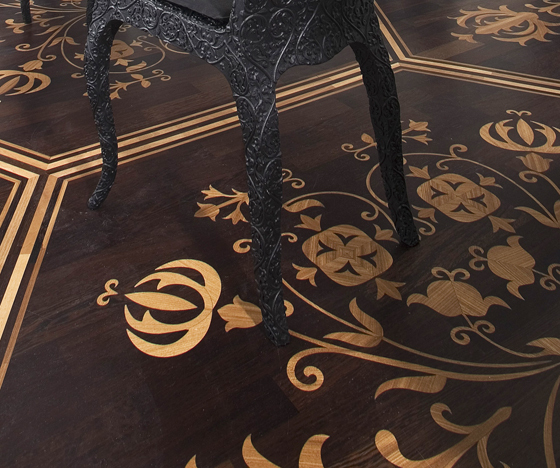 The parquet has been created with exquisite inlay work and all the surfaces within the rooms feature luxurious decoration, ornaments and the finest materials. Wanders has managed this balancing act by means of creating a reduction and abstraction in form, skilfully reducing the eclectic mix of styles to a single common denominator. 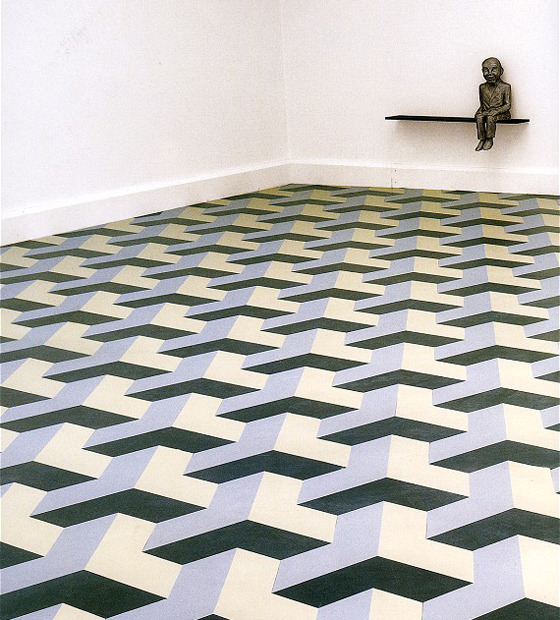 Marquetry is not often found in its intrinsic form, but in an extended sense the installation "The Wasteland" created by Juan Muñoz in the year 1987 could be described as such. 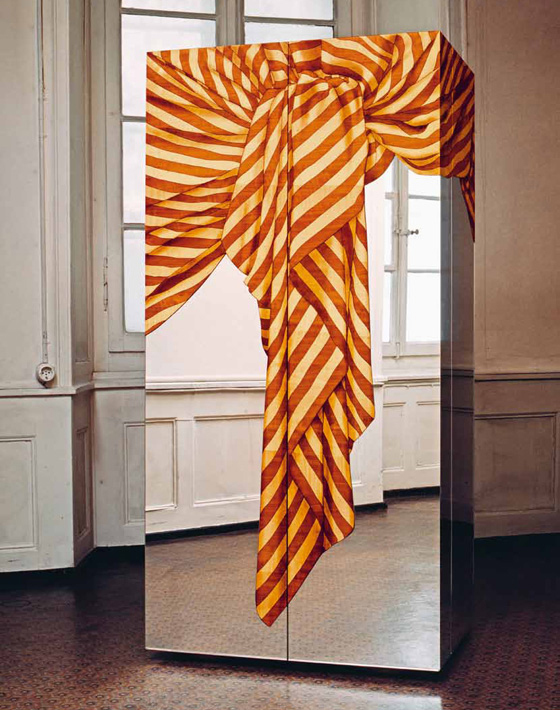 Here too we find the trompe l'oeil effect in that our perception of the room is visually distorted by the work. Inlay is therefore very much alive in modern design and we are sure to encounter it more often in future, because the techniques of traditional craftsmanship are constantly being rediscovered and in their adapted form provide the foundation for a new avant-garde. 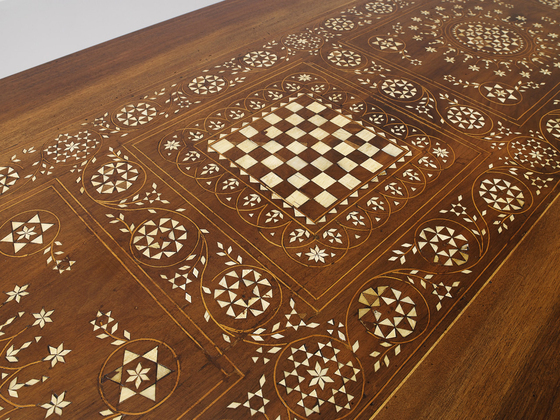 The CNC milling machine is sure to support the revival of the old art of marquetry.